Rainforests are defined as dense forests with high amounts of annual rainfall that are often located in tropical regions. 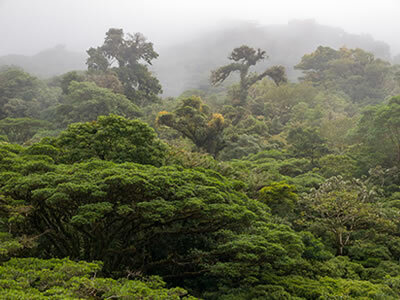 There are two types of rainforest: tropical and temperate. Tropical rainforests are often located between the Tropic of Capricorn and the Tropic of Cancer. They are generally warm and humid year-round. 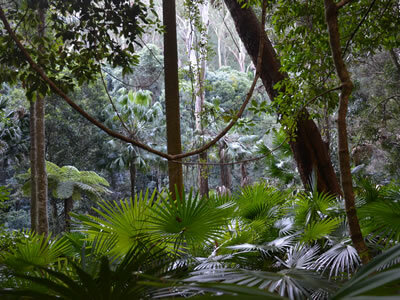 Regions that have tropical rainforest growth include Brazil and northern South America, West Central Africa, India and Southeast Asia, Indonesia, and Northeast Australia. Temperate rainforests are located in several regions across the world including the Pacific Coast of the United States and Canada, and various regions of Europe, Russia and Eastern Asia. They experience a wider range of temperatures, and are cooler than tropical types. Temperate Rainforest may often have more coniferous trees such as pines, firs and redwoods; whereas Tropical Rainforest contains more broad-leafed trees. In 1917, the rainforest was described by naturalist William Beebe: "Yet another continent of life remains to be discovered, not upon the earth, but one to two hundred feet above it, extending over thousands of square miles ... there awaits a rich harvest for the naturalist who overcomes the obstacles of gravitation, ants, thorns, rotten trunks and mounts to the summits of the jungle trees." Emergent Trees reach high above the average tree height of the rainforest canopy. These trees can grow to heights of 200 feet or more. Emergent trees do not generally grow close to one another, and will endure different conditions than other trees of the rainforest. They will receive more sunlight and less moisture because they are not confined to the shady and humid conditions that exist beneath the rainforest canopy. Animals that inhabit emergent trees include a variety of insects, some species of bats and and some species of birds including Harpy Eagles. The rainforest canopy is composed of trees that grow to heights between 100 - 150 feet. The canopy is home to a large biodiversity of plant and animal life. Animals that inhabit the rainforest canopy include Lemurs, Spider Monkeys, Sloths, Toucans, Orangutans and Parrots. Some of these animals find most or all of their food high in the trees of the canopy so that they will rarely, if ever, need to go to the rainforest floor. 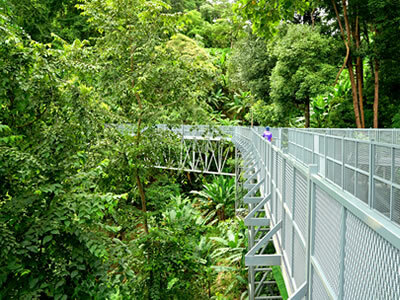 The canopy also acts as a reverse umbrella for the rainforest. It traps moisture and humidity underneath the leaves of its trees and also blocks out sunlight. 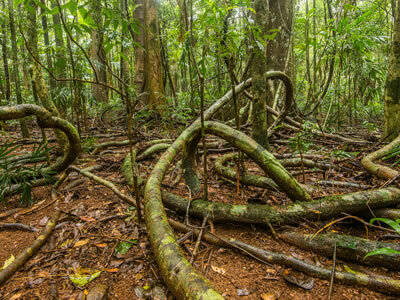 The understory is the layer of the rainforest between the canopy and the forest floor. Here, the leaves of trees and plants are broad and large so that they can capture what little light gets through the canopy. The understory is dark and humid, and has a large amount of insect life. The rainforest floor only receives between 1 - 2% of the sunlight that hits the upper layers of the rainforest. Very little plant life grows here as a result. Although the ground is covered by a layer of decomposing vegetation, the top soil is surprisingly poor in nutrients. The rainforest floor is very humid due to the evaporation of water from the leaves and shrubs that are found in this layer. This humidity will help speed up the process of decomposition of the matter. A wide variety of life including insects and larger animals inhabits the rainforest floor. Some of the larger animals that live in this layer include Jaguars, Bengal Tigers, Okapis, and Southern Cassowaries. It is believed that over 50% of the world's species of plants and animals are found in the rainforest. Amazingly, only 6 - 7% of the total land surface on Earth is covered by rainforest. On average, there are between 20 to 80 different species of trees per acre. A wide variety of animal life is found in the rainforest. Many of the animals have special adaptations that allow them to live in the tropical conditions, but they would not survive outside of this ecosystem. These animals include but are not limited to Toucans, Parrots, Resplendant Quetzals, Sloths, Orangutans, Gorillas, Queen Alexandra Birdwing Butterflies, and Lemurs. There are also indigenous cultures of people that live in and depend on the rainforest. Some of the tribes that can be found here include the Yanomami and Kayapo tribes of the Amazon, the Huli of Papau New Guinea, and the Pygmies of Central Africa. Some tribes have had little, if any, contact with outside civilizations, while others seek to legally protect the lands on which they live. These cultures have adapted to the conditions of the rainforest, and have a deep understanding of the ecosystem. They often have knowledge of medicinal herbs and plants, and understand how to cultivate rainforest land without upsetting the balance of nutrients in the soils.